A celebration of failures, doom, disaster, mistakes, miscalculations, hubris, folly and really, really bad albums. Written by the author of the cult hit, Crap Towns. Most books celebrate the exceptions rather than the rule. They focus on the over-achievers, the unique and strange success stories. They don't provide a fair reflection of the general tide of history - but they do make your average reader feel, well, more average. 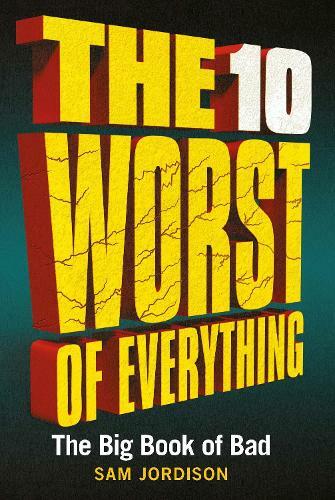 The 10 Worst of Everything redresses this imbalance and shows that you maybe shouldn't take it too badly if your own plans aren't working out. And there's nearly always someone worse off than you. Which is reassuring, if nothing else. This is a fascinating compendium of disappointing facts about the world, vital information about places to avoid, mind-boggling information about medicine, history and science, pop culture misses, as well as all the daft things we do to each other. It will help to prove the old adage that you can always learn more from failure than you can from success. And hey, even if you don't want to boost your brain, there's still the fun of watching other people go wrong.